In one hundred and fifteen years of meetings with Southampton, we have only actually played the Saints 75 times,. We've drawn twenty four and lost twenty one, Southampon have 27 victories to their credit. we did, in fact, win fourteen years ago so that's alright then! As with so many of these rambling preludes, I have to repeat myself rather too often, it's about time we started getting those figures looking a little more healthy. Well, after the turmoil and speculation, hot air and so on of the last week or so, the Big Day finally arrived, this was where we were to see whether our shabby start could be arrested. Frankly a performance along the lines of the first half at Anfield would be welcomed, hopefully an improvement on that but, far more important, we were keen to see some fight and commitment. A win? That was stretching it a bit but against fellow strugglers, it had become something of an imperative. As the Tabloids' Cliché Dictionary would put it, a Real Six Pointer! Ranieri made one change to the starting line-up that began at Liverpool in the previous game, bringing Seri back and omitting Anguissa, I suspect that I was not the only one that wasn't bothered, though it's safe to say that we have yet to see the best of Jean Michaël yet and a stone-cold certainty that what we've witnessed of Anguissa might just about be all we're likely to see. From the off, the home team found themselves under intense pressure from a very eager Saints side, however there were one or two signs that we were set-up to spring rapid raids from defence. The most striking thing about this Claudio team was a very Italianate adherence to two (fairly) well-disciplined lines of four at the back and across the midfield, yup a little burst of 'Wingless Wonders'. Also, very noticeable was that the players were adhering to the shape the team and were keenly covering and pushing back at the opposition though we were playing very deep and hardly venturing upfield in the early exchanges. It was effective though and despite all of Southampton’s neat football and adventurous attacking, our lads were gamely contesting everything and Rico was, once again, inspiring his buddies with confidence, keeping the ball safe whenever a flaw in the defensive line-up was exposed. However, it was far from perfect and seemed still to be built on somewhat shaky foundations. 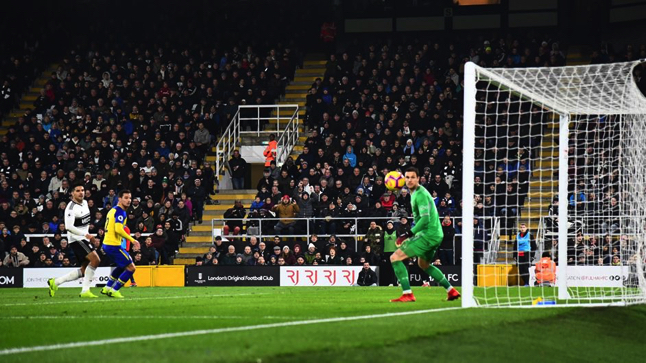 Fulham came close on around 15 minutes when a ball from Seri was headed by Chambers to be saved by the Saint's keeper McCarthy. Naturally, Southampton scored first, within three minutes of our attempt. Armstrong smacking a hard shot from the box bang in the centre. In all honesty he ought to have been prevented from making the shot had the defence not been caught out, Seri was caught napping and lost a ball he should have retained. "Here we go" must have appeared in steam over the Cottage like a Chen Trail, so concentrated were our thought patterns. 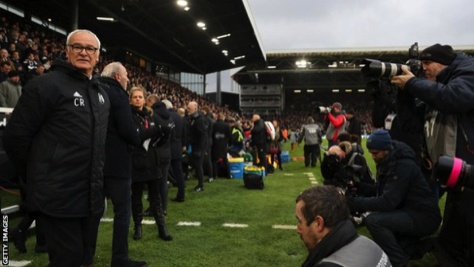 Encouraging optimism in out weary olf cynical ranks, though was the mobility and skill of Ryan Sessegnon who had started to show touches reminiscent of old. In fact, each time we gained possession, we looked dangerous and sure enough, chances were coming our way, Mitro won a free kick on 23 minutes and Odoi fed Chambers who unleashed a shot at goal which the Southampton defence dealt with. 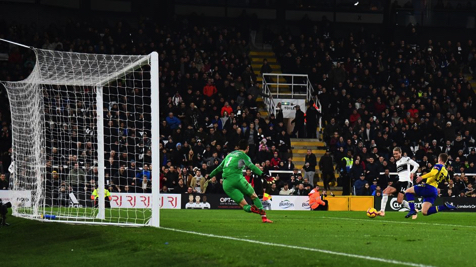 Just after half an hour, Sessegnon, was fed a pass by Mitro, his shot from outside the box whistled way over the bar. It was encouraging though. Two minutes later, Le Marchand chased a long pass fed along the ground towards the left corner of the Putney End, he just got to the goal line and put in a delicious left footed floater which an incoming Mitrovic banged into the net with a customary bullet header. Joy! Southampton attacked with zest from the restart and on 35 minutes the classy Gabbiadini whacked a well-struck attempt which our loaned keeper Rico confidentially swallowed up. Immediately released, a minute later, Christie galloped down the wing like Champion the Wonder Horse and struck a decent left footed effort wide of the post, he was looking to be moving his Liverpool improvement up a notch, he was looking confident and eager. All in all, the whole team looked the part, their close adherence to the new Manager's shape, despite it being unfamiliar to them, was making a game of it for us. Chambers, Mawson, Odoi and Christie, although by no means looking completely impervious were all playing much more like a unit and judging by my lack of palpitations, doing a fair job of repelling the opposition. The next five minutes were honours even, half time beckoning, an Alfie Mawson through ball was collected by the advancing Schürrle in a good forward move but unfortunately, he was flagged offside. Would either side be able to get an advantage of a timely goal before the ref ended the half? The answer arrived courtesy of our German star, on the 43rd minute, Ryan Sessegnon again showing why we love him with some excellent work, in move of six passes, culminating in a super cross which André met with a sweet left footed shot into the right-hand bottom of the Southampton net. The following minutes saw a good move and pass by Le Marchand to Mitro flagged for offside, Mawson picking up a yellow card and a move by Fulham’s last season loan favourite Matt Targett laid on for Hoedt whose header went wide to our keeper’s right, then on 47 minutes the ref cried “Enough!”. The second half began in much the same way that the first 45 had, a Saints corner followed by Schürrle feeding Mitro whose shot was saved. Southampton equalised on 53 minutes, Armstrong scoring his second of the game. The game yo-yo’d between both side for the following exchanges until the Sessegnon-Mitrovic combo clicked again, Ryan supplying the pass and Aleksander whacking the ball home ten minutes after the Saint’s’ equaliser. That was the way it remained until the referee finally blew after six minutes added time. All in all, this completed a very entertaining game with the best outcome as far as we were concerned and Claudio has a 100% record at Fulham now. Now for SW6! on Sunday December 2!